Hayball’s latest student accommodation project sits within the University of Melbourne’s new innovation precinct, located on the corner of Swanston and Grattan streets in Carlton. The new precinct will be a completely integrated offering that combines spaces for industry, research and development, academia, accommodation for postgraduates, a public showcase and community facilities such as childcare and retail. Hayball’s project will sit at the heart of the new precinct showcasing an evolution in the quality and integration of student accommodation. 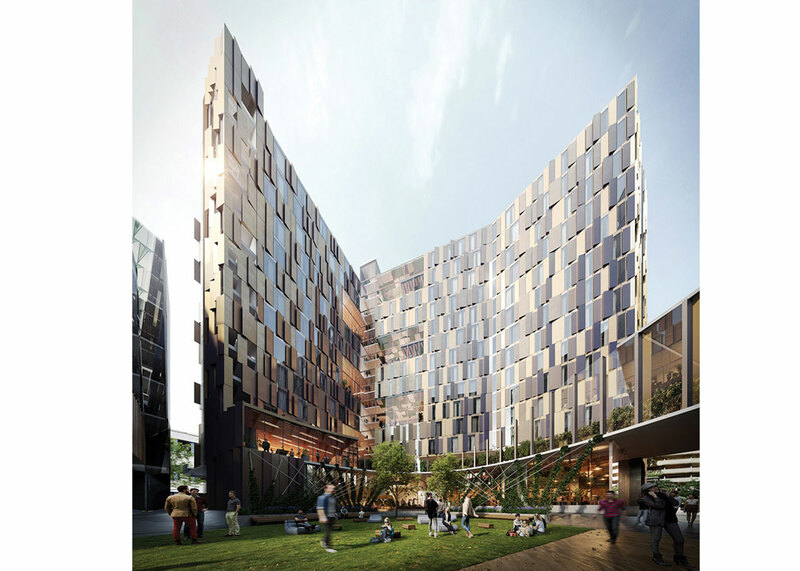 In partnership with the University of Melbourne and as part of the Lendlease-led consortium delivering the project, Urbanest will operate the facility marking its first foray into on-campus student accommodation. The purpose-built living hub will offer 527 beds and extensive multi-purpose spaces to cater to the postgraduate market as well as visiting academics, in an initiative that champions innovation. Hayball is passionate about creating student accommodation that is specifically designed to foster information sharing, collaboration and connection. This is just one of the many student accommodation projects we’re currently working on, a number of which are in collaboration with the University of Melbourne within the wider precinct, enabling the University to reach its goal of offering a number of purposeful and affordable local beds for students. With innovation districts becoming more popular across the globe, this Melbourne example stands out because it will also be a home for students and academics. Postgraduate students and visiting academics will experience true immersion in the precinct, living and breathing their research or studies while making the most of countless networking opportunities and Melbourne’s vibrant culture on their doorstep. Hayball designed the space to encourage students and academics to meet, interact, exchange views and generate ideas within an ultimately flexible and connected precinct The spatial manifestation of this initiative is the vertical street: an interconnected staircase, directly adjacent to the communal spaces, and opposite the lift core. No walls, no glazed partitions and no doors – a true atrium, open, connected and inclusive.